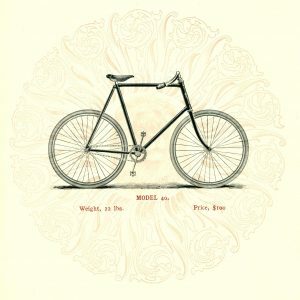 A new technology gained widespread popularity toward the end of the 19th century, opening up new options for mobility in urban centers and small towns alike. 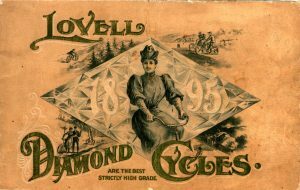 The bicycle brought with it new avenues for transportation and freedom, particularly for women, inspired dreams of adventure in its users, and created celebrities in bicycle racers and trick riders. 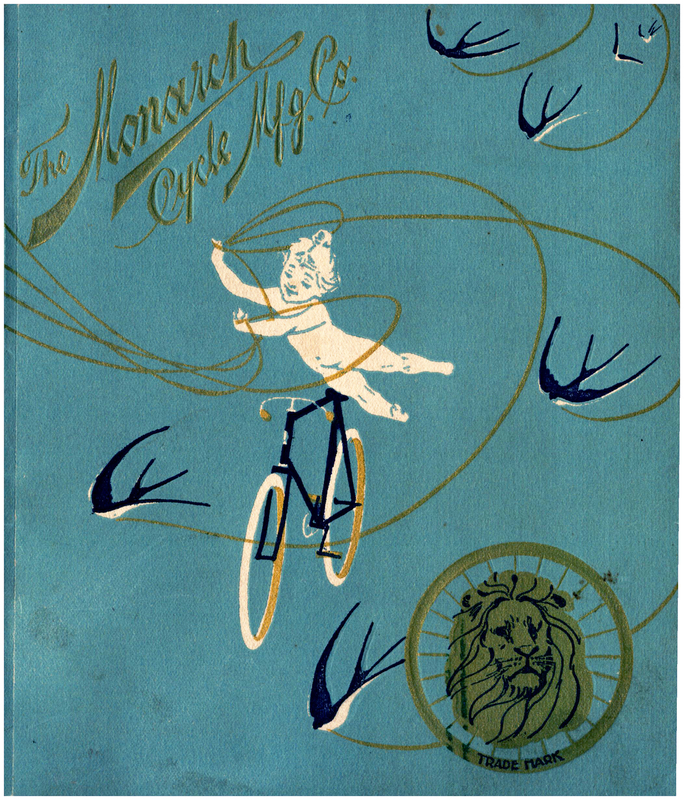 This is all reflected in the bicycle catalogs produced by manufacturers at the time. 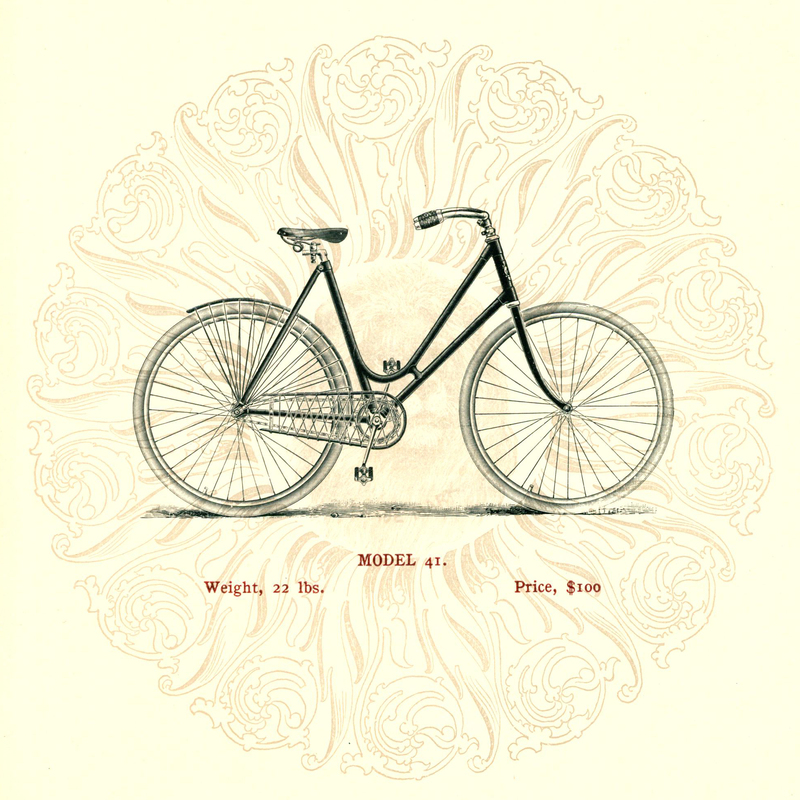 One center of this revolution in mobility during the 1890s was Chicago, which was home to hundreds of bicycle manufacturers – ranging from mom & pop shops to large factories employing thousands of people. 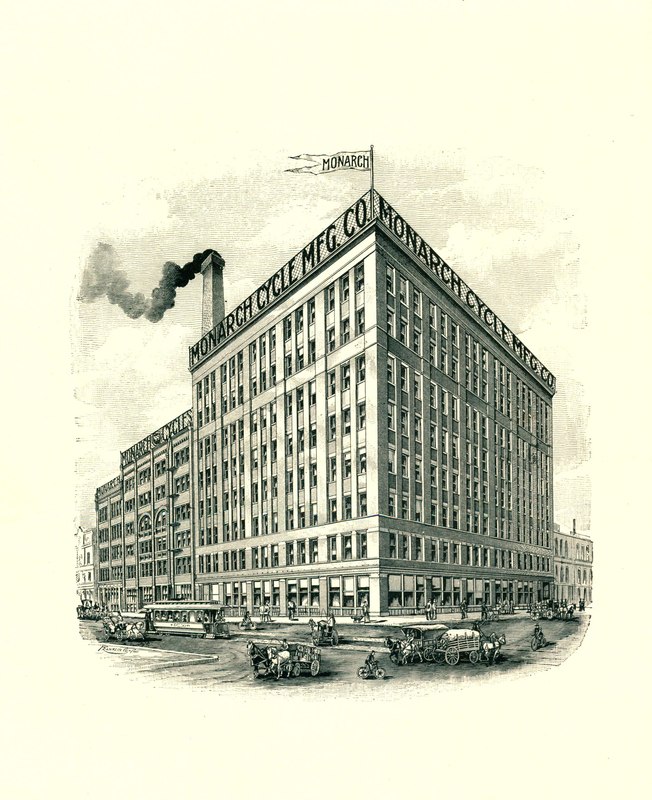 By the early 20th century, that number dwindled drastically as the craze lost its momentum and the automobile began to emerge as the dominant transportation mode in the United States. 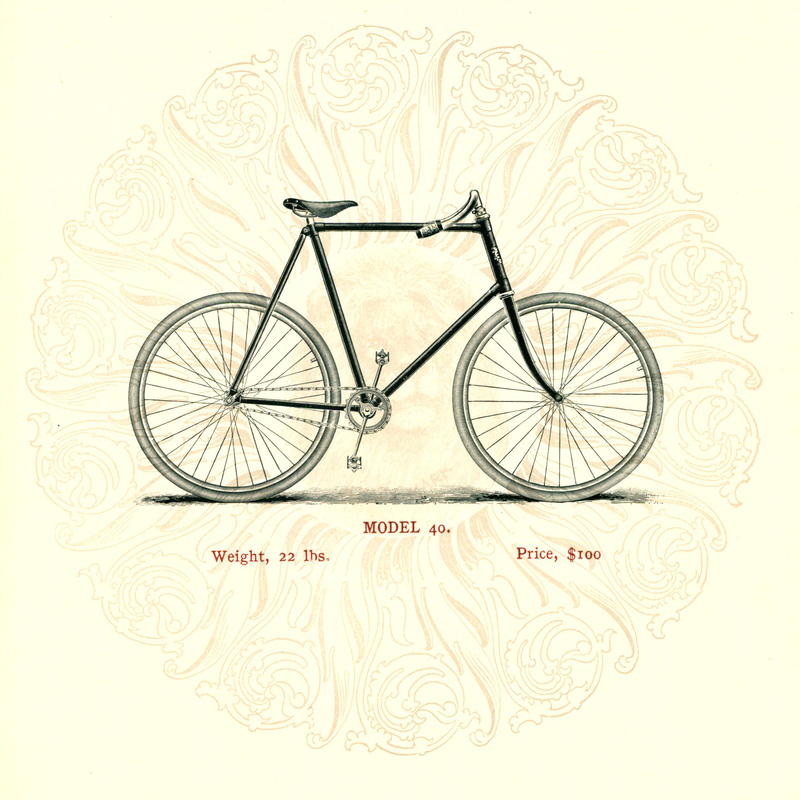 Catalogs from bicycle manufacturers dating from the 1890s, particularly Chicago manufacturers, are a growing collection at Northwestern University’s Transportation Library. 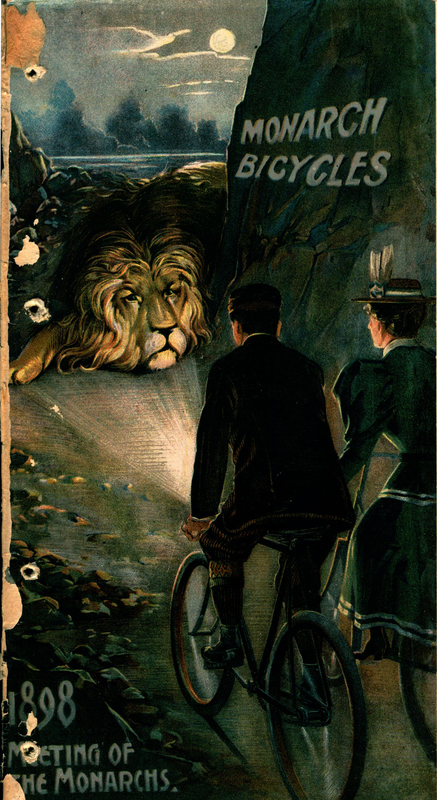 A few examples are highlighted here. 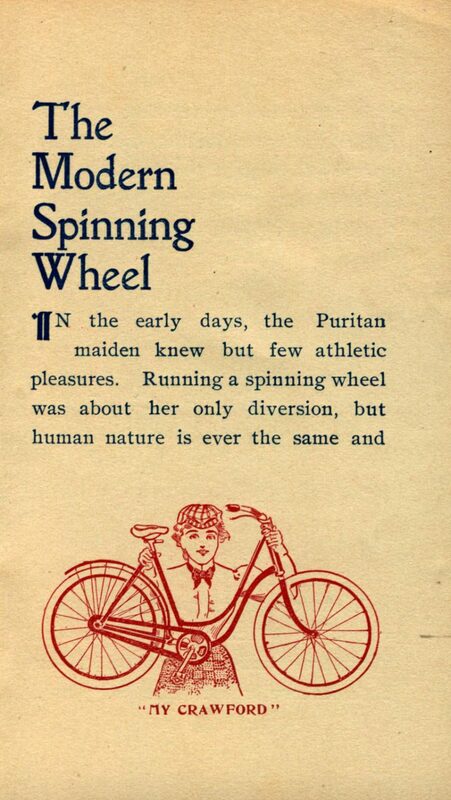 “In the early days,” reads the 1898 Crawford Manufacturing Co. catalog pictured here, “the Puritan maiden knew but few athletic pleasures. 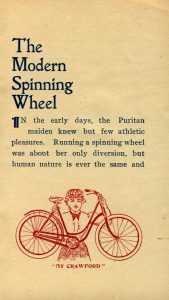 Running a spinning wheel was about her only diversion, but human nature is ever the same and it is not to be doubted that at times she inwardly revolted at the narrow sphere of physical enjoyments and showed her resentment by making those wheels go round with a buzz. If she could pay us a visit now she would be much interested in the ‘modern spinning wheel’ which her 20th century brothers and sisters use. 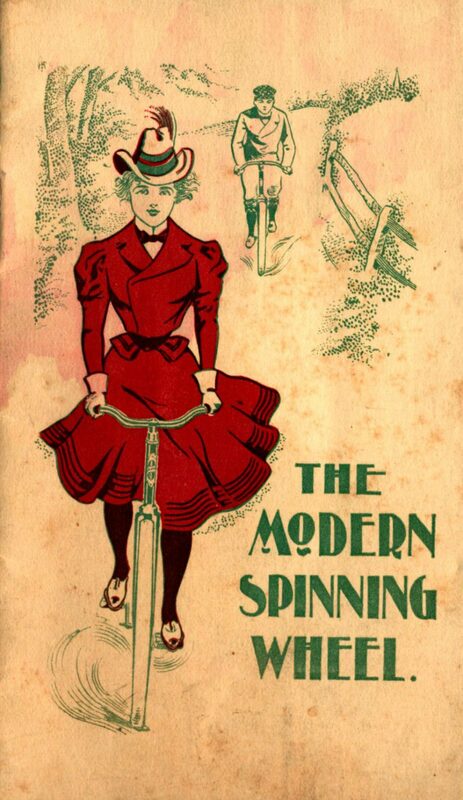 Perhaps she might want to ride it and being so accustomed to pedaling in the act of spinning it wouldn’t take her long to learn. 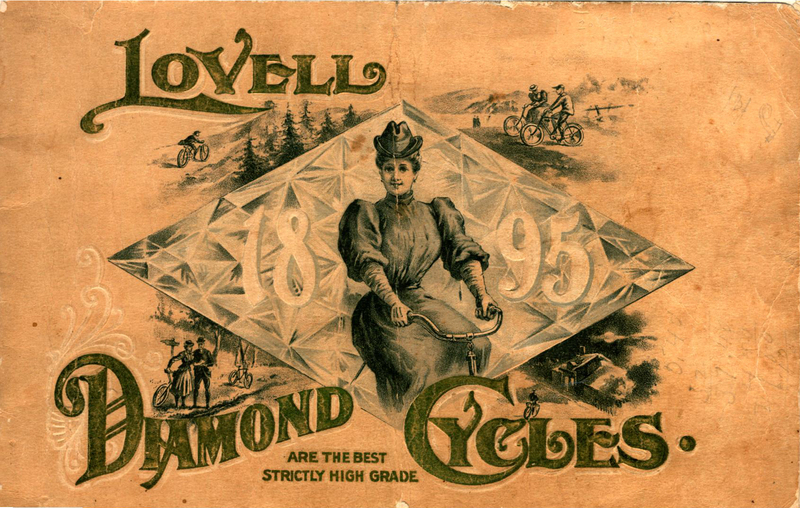 After a few bumps and tumbles, which might ruffle her dignity a bit, she would be able to take exhilarating rides around the country.” Though Crawford was based in Hagerstown, Maryland, it listed a Chicago outlet on Wabash Avenue among its locations. 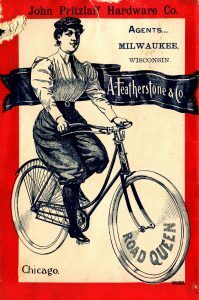 Many other catalogs featured women on their covers and in their pages: manufacturers recognized a significant market in women’s cycles. 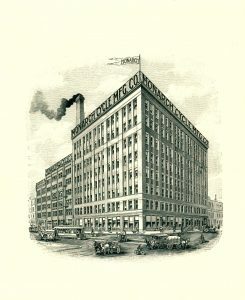 Pictured here are the 1895 catalogs from J.P. Lovell, a Boston-based manufacturer, and A. Featherstone, based in Chicago. 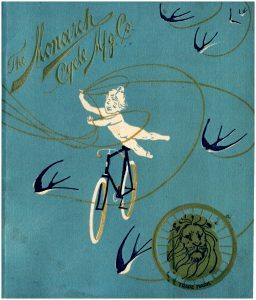 In today’s climate of dozens of mobility options, it may be easy to forget that in 1890, the option to wander far from one’s own house was a relatively new concept for most Americans, and the bicycle’s ability to transport riders to far-flung destinations and new discoveries was celebrated in bicycle catalogs such as Wanderings Awheel, produced by Chicago’s Mead Cycle Company in 1898. 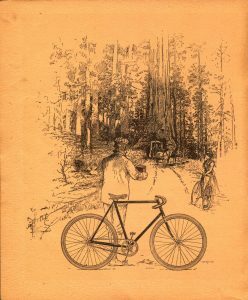 The catalog features seven illustrations of cyclists on a wandering tour around the United States, complete with detailed illustrations of models that were available for purchase. shown in a variety of destinations including the urban and wilderness scenes pictured here: Wawona, the famous sequoia that stood in Yosemite Park’s Mariposa Grove until 1969 (image 1), and Boston Common (image 2). 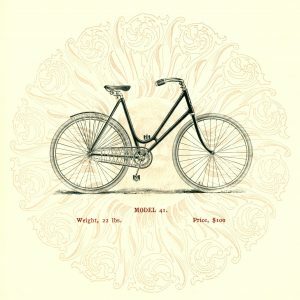 Featured in the Boston Common scene is the Ladies Sentinel Special, available for purchase at $75 with a drop frame and “dress and chain guards of the most improved pattern.” The Wawona scene features the Sentinel Model B, a “handsome and trusty mount,” selling for $50. 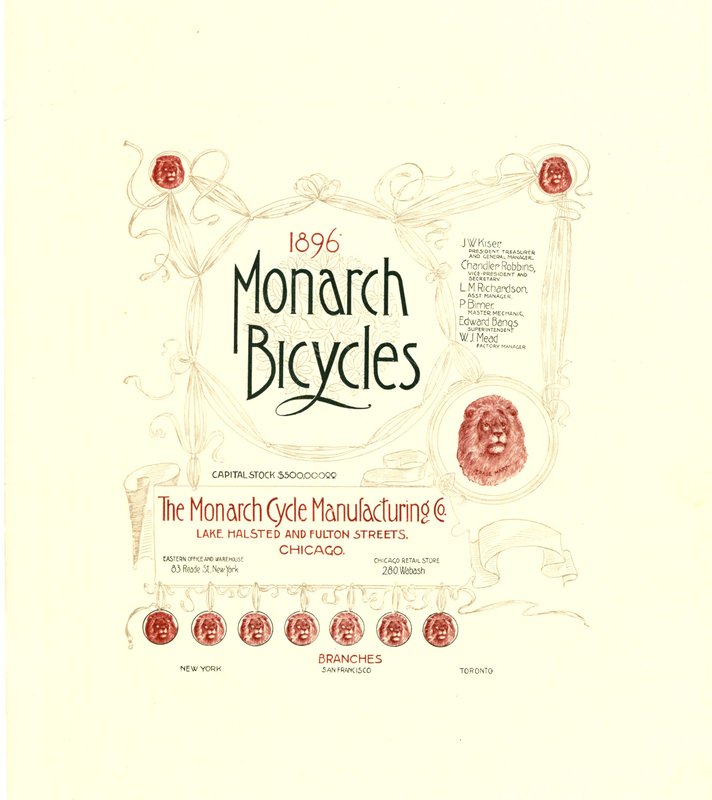 Chicago’s Monarch Cycle company operated out of a headquarters and factory at Lake, Halsted, and Fulton Streets in Chicago, with offices in New York, London, and Hamburg. Among the company’s beautifully designed catalogs are the two pictured here, from 1896 and 1898. 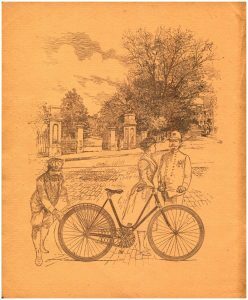 The 1896 catalog also hints at the celebrity bicycle culture that existed at the time, with a page featuring Lee Richardson, known as the Premier Fancy Bicyclist of the World, and Tom Cooper, champion bicycle racer. 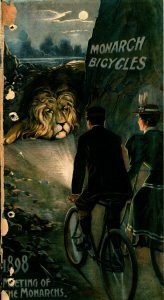 Also shown are J.P. Bliss and A.E. 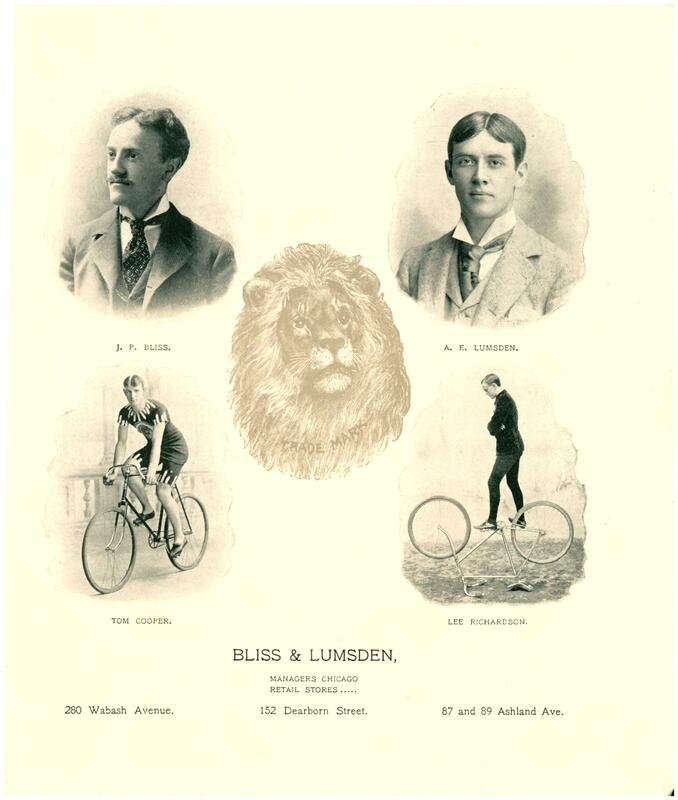 Lumsden, owners of Bliss & Lumsden, a premier retail outlet for cyclists in Chicago with locations on bicycle row Wabash Avenue, as well as Dearborn Street and Ashland Ave., who were themselves champion riders.